Inspired by Melt (Zimmer Remix) | Kamp! Have you ever gone crazy trying to cook a caramel based recipe where, out of the blue, everything went wrong, it burns and suddenly all hell broke loose? Me, yes! It took me some time to master it (the secret : a thermometer!) 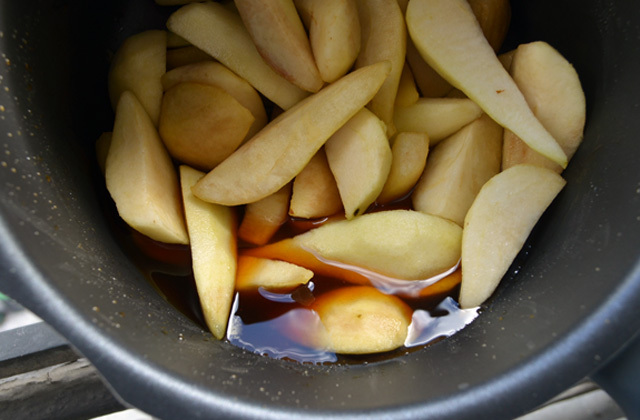 but after a few experiences a tried something that I particularily liked : making a caramel with pears inside. This is not per say working the consfisage technique but we do play on the osmose process to get melted pears with a delicious caramel taste. Besides caramel, I am also obsessed but any kind of pie based recipe but I was getting bored of regular pies. So to change a bit, I decided to try a rolled pie. It’s easy and nice. No more excuses next time you are supposed to make a desert ! 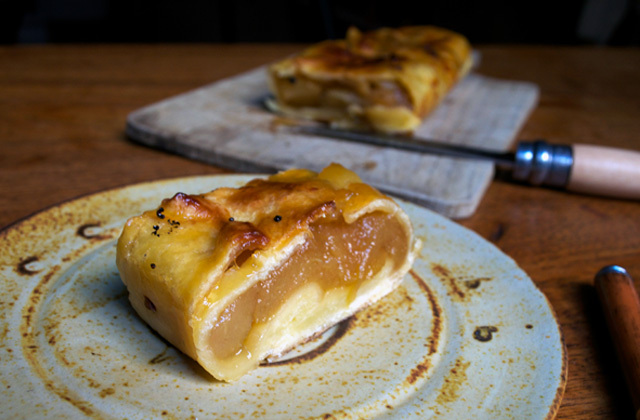 This recipe has very few steps : caramelize the pears, set the pie crust on a pan and bake. 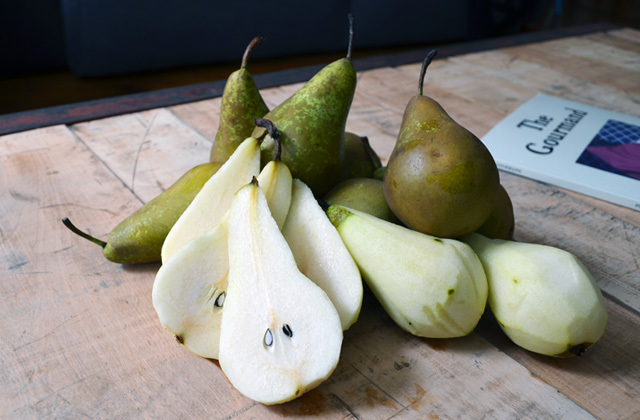 Start by preheating your oven to 180°c and peeling your pears – yes there are many and it’s quite boring, but it is worth it ! Cut them roughly (take out the hard middle part with the seeds) and put them all in a big pan, add the sugar and water until they are covered. The idea here is to slowly caramelize them without loosing any juice. This can take a little while… the more you heat up…the faster it will go, but you have to be careful to avoid burning the pears on the bottom ! Go with medium heat, let it caramelize say… half an hour, that should do it! 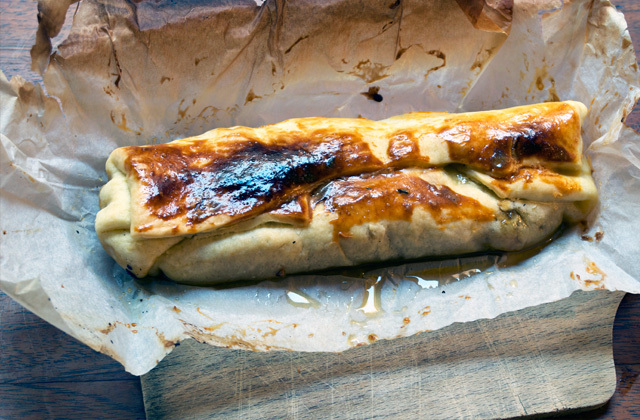 Since this is a rolled pie, you’ll need to work on a rectangular baking pan. While the pears caramelize, prepare the pie-crust and make sure the middle of your cercle hits the middle of the pan as you will need enough crust to “hold” the pears together inside. Once they are ready, strain them and save the extra caramel. Why? As it will have absorbed all the juices it will taste amazing / we will be able to use it as a coulis / if you garnish the pie with it, it will spill all over and burn while baking. 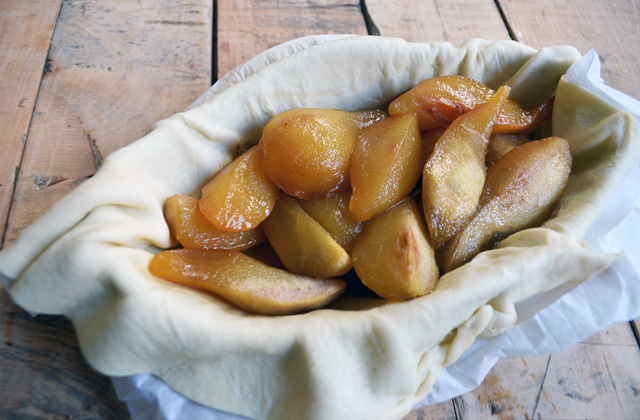 Without waiting any further garnish your pie with the melty strained pears and close it each side on top of each other making sure that it is pretty tight. Glaze with the egg yolk and put it in for 20 minutes on one side, take it off, turn it upside down, and in for another 20 minutes so it baked homogeneously. Serve it tepid or cold, but above all do not forget the pear-caramel coulis over the top! Feli, I will try it! great! let me know !